protein needed by many invertebrates to complete their life cycles (Anderson 1976), and also may form an important link between microbial and macroconsumer food webs. lula depressa (Odonata) were observed to strike at a mayfly nymph in response to either mechanical or visual cues, but mechanical cues were primary and did not require contact, and chemical cues apparently were ineffective (Rebora et al. 2004). Indeed, chemical detection of prey is important only in a few predaceous insects in the Hydrometridae and Dytiscidae, but it may be important in other invertebrates. Lake-dwelling triclads exhibit a chemosensory response to their isopod prey (Bellamy and Reynoldson 1974), and presumably stream-dwelling triclads do so also. The water mite Unionicola crassipes locates prey primarily by mechanoreception and vision, but it also becomes more sedentary in prey-conditioned water, suggesting that chemical detection promotes area-restricted search behaviors that presumably enhance encounter rates (Proctor and Pritchard 1990). Sit-and-wait predators include those that simply remain motionless until the prey approaches within striking range, and those that trap their prey using nets (e.g., caddis larvae, Townsend and Hildrew 1979) or mucus trails (e.g., flat-worms, Adams 1980). Odonates that usually ambush also will stalk prey (Johnson and Crow-ley 1980), perhaps influenced by hunger level. 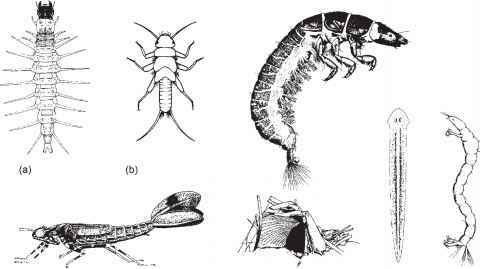 The caseless caddis larva Rhyacophila nubila captured agile mayfly nymphs from sheltered positions, whereas it captured sedentary black fly larvae upon random search (Otto 1993). Sjostrom (1985) reported that D. cephalotes searched in darkness, but was primarily a sit-and-wait predator in very low light. Risk from its own predators is the most likely explanation, although ability of prey to escape may be an additional factor. Predators often are undiscriminating in their diets, capturing whatever they encounter that is small enough to subdue. Aspects of the predator that bias it toward consuming more of some prey than others include sensory capabilities, foraging mode, and behavioral mechanism of prey capture. For prey, many aspects of body plan, life style, and behavior influence their vulnerability. These traits of predator and prey are not easily separated. From the many studies of the diet of predaceous invertebrates, usually based on gut analyses and behavioral observations, body size, prey availability, and prey vulnerability are of particular importance in determining what is eaten. Size relationships between predators and their prey, as well as within a guild of invertebrate predators are of critical importance to food web relationships, a topic discussed in greater detail in Section 9 2.1.2. Typically, the average size of ingested prey increases with size of predator, as does the variety of prey items consumed. Predaceous stoneflies tend to ingest diatoms and other nonanimal items when very small. Diet changes gradually over development, often consisting primarily of chironomids in early instars, and then broadening to include a menu in which mayflies, simuliids, and trichopterans supplement and may eventually replace midge larvae as prey. Although some differences are reported among species and study locales, presumably reflecting differing availability of prey, any two stoneflies of about the same size, when in similar habitats, consume diets of similar species composition. 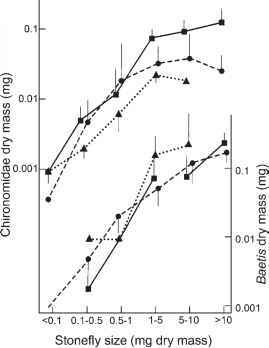 By measuring head widths of ingested prey and converting those values to dry mass, Allan (1982a) showed a very similar positive relationship between prey size and predator size for several species of predaceous stoneflies and the two most common preys, Baetis and Chironomidae (Figure 8.10). With an increase in the size of prey ingested there usually is an increase in diet breadth as well. Small predators tend to have less diverse diets because they do not reach sufficient size to capture prey larger and more agile than midge larvae. Analysis of gut contents typically reveals a good correlation between what is eaten and what is available. In a small and relatively species-poor stream in southern England, the caddis Plectrocnemia conspersa and the alderfly Sialis fuliginosa during summer consumed prey roughly in proportion to their abundance (Hil-drew and Townsend 1976). Similarly, the rank order of prey taxa in the diet of large Hespero-perla pacifica was similar to the prey rank order in the benthos (Allan and Flecker 1988). There is some evidence that prey availability is such a decisive factor that it may override differences between predators in foraging mode. The net-spinning P. conspersa and the more mobile S. fuliginosa exhibited considerable overlap in habitat use and diet, although the former consumed more terrestrial items, large stoneflies, and small chironomids, which apparently were more easily trapped in the net of P. conspersa (Townsend and Hildrew 1979). leech Glossiphonia complanata foraging for snails in the laboratory spent more time than expected by chance in patches containing prey compared to empty patches, although it did not discriminate between high versus low prey patches (Bronmark and Malmqvist 1986). In summary, the classification of invertebrates into functional feeding roles based on food-gathering mechanism and food type has proven to be an effective tool for understanding trophic relationships in fluvial ecosystems. Stream-dwelling invertebrates occupy all trophic positions and form important links between basal resources and top predators. Individual taxa often change their feeding role during their life cycles, and flexible feeding habits allow many to shift or blur the lines between FFGs. 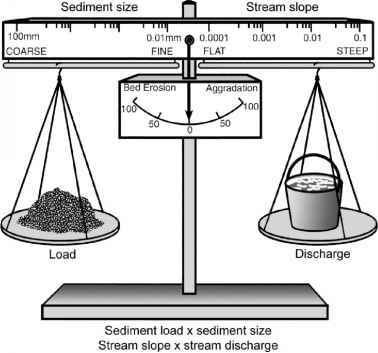 Nonetheless, the FFG classification of the invertebrate consumers of streams has demonstrated great utility for description and analysis. Much progress has been made over the last several decades toward understanding the various energy sources and how they are used. Characteristics of a particular river, including its size, hydrology, and the vegetation of the surrounding landscape significantly influence which pathways predominate. As long as one does not lose sight of the fact that FFGs are working conveniences, they serve as useful building blocks toward a broader synthesis in stream ecology.